In preparing for the print edition of Tenth focused on Rivers (now at our distributors! ), we heard a lot of river stories. Some false, some exaggerated, and some completely true. One such story is about Terry Hughes (b.Dec.17, 1940, d. Nov.8, 1959). The name may be familiar to you – this is the sports field and playground park on the corner of McBride and 8th Avenue, beside École Glenbrook Middle School. But who is Terry? And why was this part of New West named after him? And why am I calling this a “river story” when it’s easily a kilometre away from the riverfront? 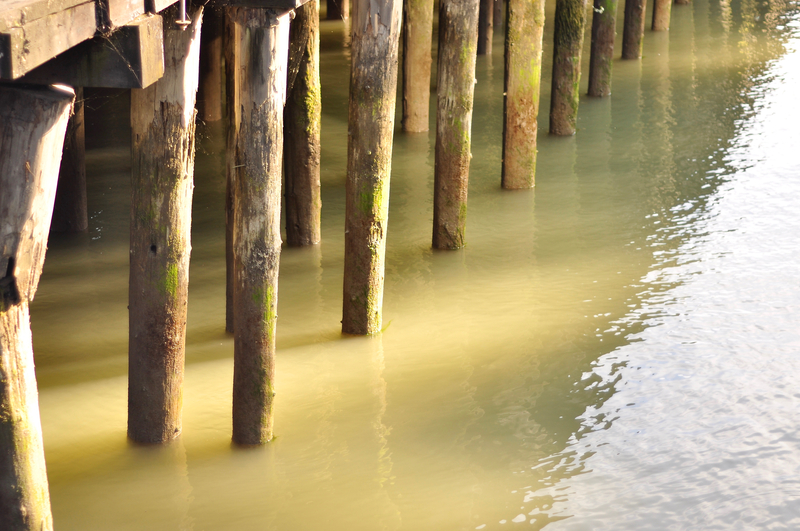 Horizontal and vertical lines- pilings in the water. 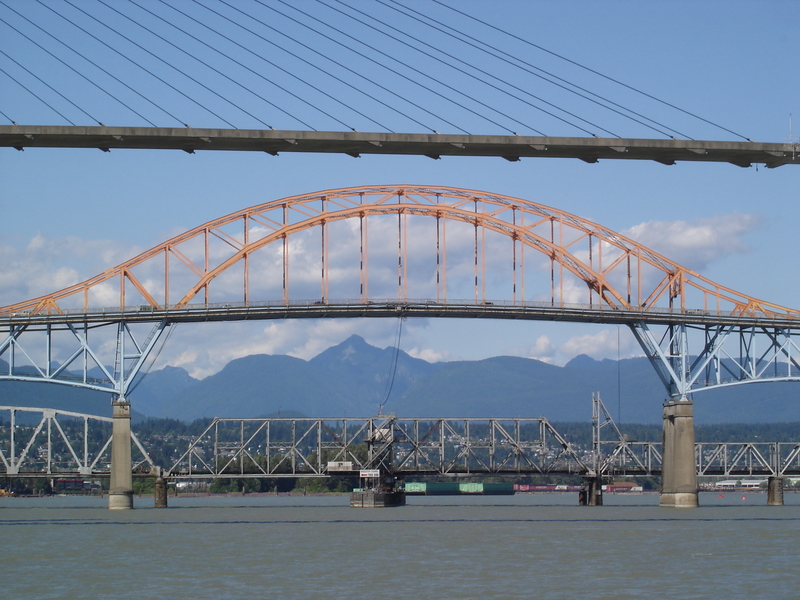 Hughes was a New Westminster boy who attended Lord Kelvin Elementary and had just graduated from New Westminster High School. While playing with some friends on log booms along the shore line near the Queensborough Bridge, a young girl fell into the Fraser River. Hughes died trying to save her. Terry’s body was recovered the next day. He was buried in Fraser Cemetery with a police guard of honour and mourned by a community shocked by the tragedy. Terry’s mother, Mabel Hughes, accepted the presentation of the Royal Canadian Humane Association’s Medal of Bravery in his memory. This site was part of a large civic property purchased by the federal government in 1947. It became the location of a new Westminster Regiment armoury which replaced the historic 1896 structure at Sixth Street and Queens Avenue. The new building was planned for construction after World War II, but funding was not available; eventually the project was abandoned and the federal government turned part of the site into the rented apartments of the Glenview Veterans Housing project. The lower, swampy portion of the site occupied by a section of the Glenbrook Ravine had been partially filled as part of the Glenbrook Sewer project of 1912. Eventually, the ravine was completely filled, and the City leased the site from the federal government. It was partially developed at that time and called Jackson Park, after Mayor Toby Jackson. In 1959, a local boy named Terry Hughes lost his life while attempting to save a young girl who had fallen into the Fraser River. Councillor Jack Allison suggested re-naming the park in Hughes’ memory. The leased park site was developed in 1961 with a playground and softball diamond. In 1992, the federal government announced the redevelopment of the Veterans Housing site. The city negotiated a significant portion of the land to form the site of the new Glenbrook Middle School as well as a new civic-owned Terry Hughes Park. The new, improved, and rebuilt park was dedicated on September 30, 2000 with members of the Hughes family in attendance at the ceremony. Terry’s grave is in the Upper Fraser section of the Fraser Cemetery, and is often included in walking tours of the cemetery.